Many fond memories of shaping early interaction design courses way back in 1993 persist here at the bivouac. I was fortunate to enter the field at a time when computing had matured just enough to become accessible to a wider range of creatives. I was also lucky to teach both introductory and advanced courses in computer visualization. 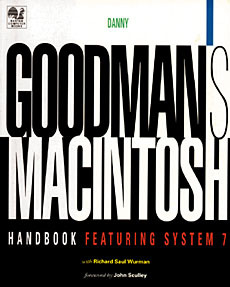 For the introductory course, I relied upon Danny Goodman’s excellent Macintosh Handbook Featuring System 7. Bringing together Danny Goodman and Richard Saul Wurman, this publication was and remains an exceptional example of accessible and visually delightful educational material. The illustrations are clear and inviting and they demystified the breakthrough technology on offer from Apple at the time. For other inspirational publications check out the bivouac’s list of design related readings. Overall, Danny Goodman’s Macintosh Handbook remains an outstanding exemplar of clear and inspirational instructional reference material. It is one that passes the test of time in a fast moving technical context. For a first hand account of what went into creating the publication visit Nathan Shedroff’s site article. 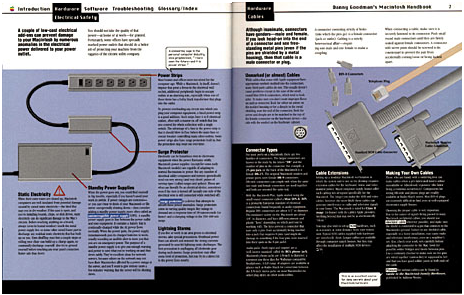 The publication visuals mimic the Macintosh operating system visuals including a “finder” menu along the top of many pages, to further demystify the new to world Apple technology.